Today was spent shopping for the event. I just can not do the "shop till you drop" thing anymore. By the time we got to Fred Meyer for food stuffs, I was in so much pain and had so much fatigue that I had to use the store scooter and...I forgot to bring in my list. Ali did the regular household grocery shopping while I did some shopping for the event, sans list. Needless to say, we need to go back to a grocery store to get the stuff I forgot. Tomorrow will be spent dying the rest of the cloth yellow along with a t-shirt I got at JoAnns and I'll be making myself some "GrynWear". 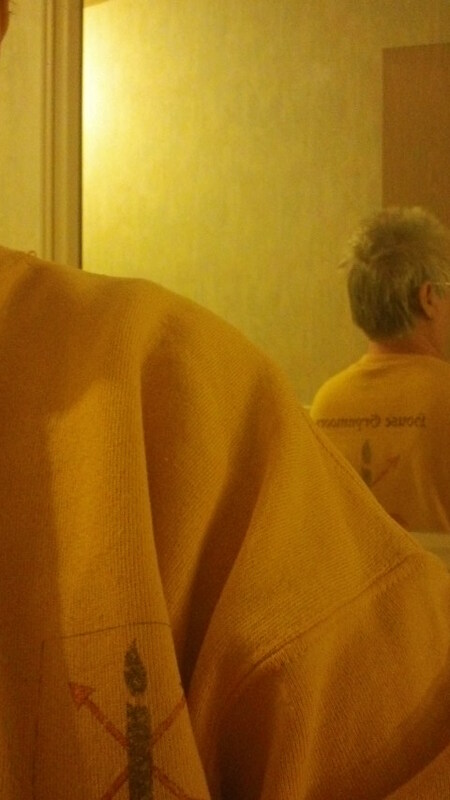 That's yellow t-shirts or sweat shirts with the household device printed on them with "House Grynmoors" in Old English letters on the back. Here's a sweat shirt I made 10 years ago. I got the batteries for the camp shower that I was going to use as a kitchen sink faucet, but sadly, the pump is toast. We never got to use it and they don't make them anymore so, double bummer. We'll try and find something else we can use. Maybe a foot pump. We'll see. I'm keeping the hose with the shower head. I scored on a twin sized wood bed from from IKEA at St. Vincent de Paul's. This was a totally unexpected purchase which put me over budget but I couldn't pass up the opportunity and the price ($30). It looks easy enough to put together that I'm hoping I can use it at events as well as in the house (I currently use a cot). We'll find out tomorrow. Ali is going to make slats since I don't have a boxspring for it. Photos and more on each topic to follow tomorrow as currently the both of us are toast and will be such all the rest of the evening.